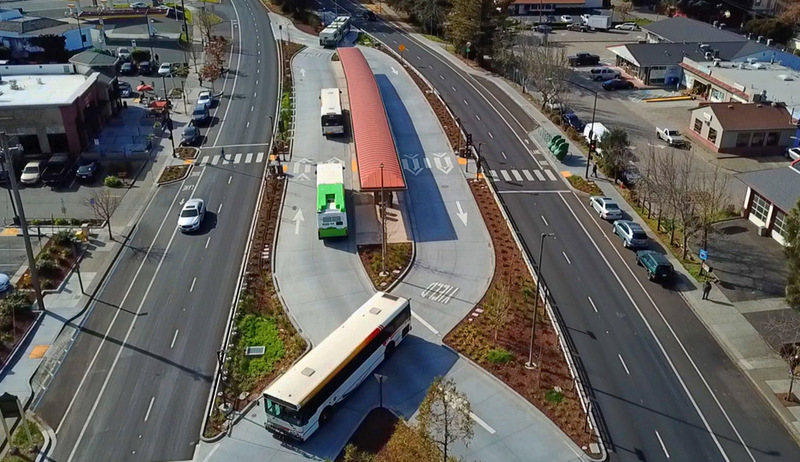 To provide safer and more convenient access, safe and comfortable features for transit users, and improvements for bus and traffic operations, the redesigned transit center includes a combined center platform to provide a more attractive and functional facility. Transit vehicles cross other vehicle paths on entry and exit to the center island, which allows it to serve standard buses from multiple agencies, rather than dual-door buses. This innovative contraflow design is offset from the roadway, highly visible, ADA-compliant, with increased capacity, and allows transfers to be completed without crossing bus lanes. The facility improves pedestrian access with raised pedestrian crosswalks within the facility and signalized crossings of Redwood Boulevard, the major thoroughfare through Novato. CHS Consulting Group designed and implemented transit signal priority responsive system (TSP) for the ingress and egress operations, a pedestrian- and transit-initiated midblock signalized pedestrian crossings, and interconnect with adjacent signalized intersections. CHS also responded to the concerns about conflicts of contra-flow design and possible sightline issues when buses entering traffic flow along Redwood Boulevard and queuing issue within the center as well as along Redwood Boulevard on egress by devising a creative solution that meshes with the City of Novato’s existing traffic signals. The solution combines an integrated pedestrian- and transitactuated signal at the hub with TSP and interconnect in the adjacent intersections. The implemented operations plan, including development of system phasing and timing sheets and direct connection of input/output interconnect, eliminating bus queues on exit and increasing throughput, while simultaneously enhancing passenger and pedestrian safety.